our old pals at desert mountain brewing gave us some intel on the purple frog gardens. it turns out that every wednesday, you can show up from 9am-1pm and weed their beds or do other tasks they instruct and they’ll give you bags upon bags of fresh organic produce that they grow. this sounded like a too good to be true score for the hungry traveler, so we jumped at the opportunity and decided to volunteer two days in a row while waiting for the sun to come out in glacier national park. we got to purple frog a little after 9am and after a few minutes of poking around found someone to let us in. the rain had taken everyone to shelter, but as we walked in it calmed a bit and everyone was coming back out to the rows of veggies to get to work. we met Pam and Mike who run purple frog. 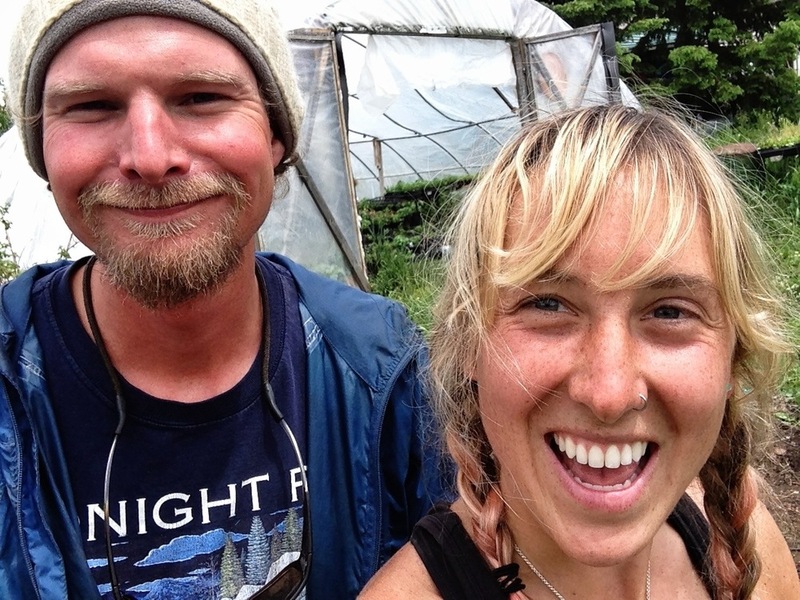 on their way to alaska quite a few years back they got sidetracked in white fish for a month or so, then ended up buying a plot of land and the rest is history in the making… they treated us like pros and told us to get to work weeding the onion beds. after asking some of our weeding neighbors what and what not to pull we became weeding machines, and completely overcame our fears of spiders……. there is something very gratifying about getting the entire root out when you pull a weed. i’m sure this is obvious to anyone who has spent a minute gardening, but for the somewhat newcomers, it’s a great motivational challenge. when you miss the root, even once, you feel like a total failure and strive to get the perfect pull next time. we weeded several beds and even cleared a full bed that potatoes and garlic had previously occupied — we saved any leftover garlic to pass out to everyone at the end. there were about ten or so volunteers so taking a look back at the progress we made was pretty cool — the original task looked terribly daunting. the purple frog is a really cool spot. everyone there was super friendly, and we got some killer hiking, climbing, and camping advice from a regular volunteer named Tyler who showed up later in the day. Kelley from desert mountain brewing even showed up with a truckload of used grain for their compost — DMB uses purple frog hops in some of their brews in exchange for compost, and the plan for the coming year is to buy a pig to help out too! purple frog sponsors live-in volunteers for the summer and has some pretty amazing (from the sound of it) friends and family dinners. they are very much into contributing to the community through trade and sharing. this brings us to the truckload of veggies we were told about for helping. candice and i each walked away with two grocery bags full of kale, mustard greens, mint, dill, random chard and greens for sauteing, garlic, and tons of others! there weren’t enough volunteers to take all of the produce they we’re trying to give us. it was amazing. great day with some great people, thanks a lot for the opportunity!